"Sweet and tangy, incredibly simple, abundant in flavor! Bon appetit!" Stir 1/2 cup soy sauce, 1/2 cup sherry, mustard powder, thyme, garlic, and ginger together in a large, shallow bowl. Place pork roast into marinade and cover; refrigerate at least 4 hours or overnight for best flavor, turning occasionally. Place marinated pork roast onto a rack set into a roasting pan; discard the used marinade. Insert a probe-type meat thermometer into thickest part of the roast. Roast pork loin until thermometer reads 170 degrees F (75 degrees C), 2 1/2 to 3 hours. Combine apricot preserves, 2 tablespoons sherry, and 1 teaspoon soy sauce in a small saucepan over low heat. Stir until preserves melt. 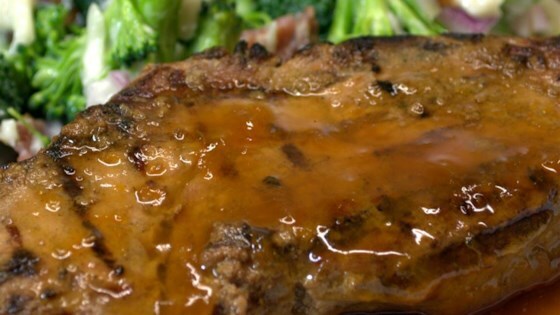 Serve apricot sauce with sliced pork roast. This was ok. The flavor was very subtle. I did marinate it over night. The sauce was good and might be better with chicken. I probably will not make again. Love this recipe! I had everything on hand so I didn't have to run out for any ingredients. The sauce was simple and a big hit with my children. This recipe went right into my recipe box. Amazing! Holiday worthy and super simple! The "only" change I made was to add some of the marinade to the pan with some carrots. Delish! Loved this! I will make again. The only thing I did different was I added worchester sauce because I was out of soy. My husband loved it! This was very tasty! I let it marinade about 6 hours and made no changes to the recipe. The glaze makes this recipe a keeper. Will make this again!